As Kobe turns 35 this week, we'll be taking a look back at a handful of sneakers he began wearing with Nike. 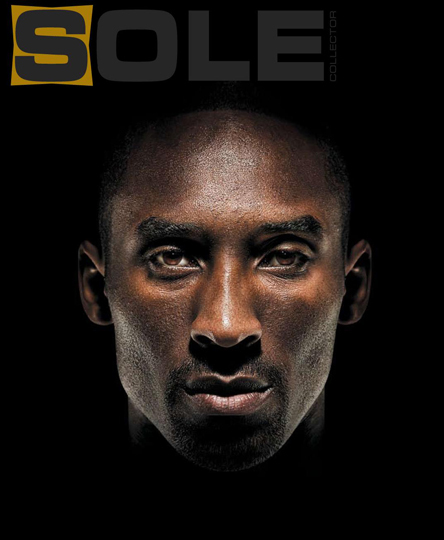 As published in Sole Collector's Issue 26 : Available here. Just after the turn of the millennium, there was quite a bit of uncertainty about Nike's stable of basketball athletes. Michael Jordan had just retired after an illustrious career, only to return and briefly play for the Washington Wizards for just two seasons. Surely, that didn't mean much in terms of having a long-term face of the brand that would carry the brand deep into the future. At the time, Kevin Garnett was no longer a Nike athlete, LeBron James wasn't yet signed to his monstrous endorsement deal, and there was still a void in the realm of superstar athletes as Tim Duncan's personality didn't quite excite consumers, and the youthful skill of Gary Payton seemed to be diminishing. Vince Carter may have been leap-frogging actual humans while dunking, but there still wasn't a proven franchise athlete that the brand could depend on. Luckily for Nike, Kobe Bryant was a sneaker-free agent of sorts, and the brand was looking at the three-time champion as a vehicle for not only the future of Nike Basketball, but also the future of performance footwear and innovation. It was around that same time that Nike had just opened its Innovation Kitchen, an advanced timeline sector of the company's headquarters where designers and developers would be given the space to work years ahead on projects of the future, toying with everything from new materials to new cushioning systems and anything that could potentially revolutionize or improve their current athletic categories. Just before Kobe Bryant was officially signed to the brand, current Nike CEO Mark Parker called upon accomplished designer Eric Avar, who had previously had great success with the signatures lines of Penny Hardaway, Gary Payton and Jason Kidd. "I had just transitioned from in-line basketball down to the Kitchen, and actually, I was looking forward to having a break from basketball," admits Avar. "I was looking forward to working on running, cross training and other things. I was there for all of two months and Mark Parker called, and he said, 'Hey, we're thinking of signing Kobe, and we would like you to work on his product.'" The return to working on basketball product would be different for Avar this time around, as compared to the decade he had spent within Nike Basketball, as he would now be working out of the Innovation Kitchen and be given more resources, more room to try new things and more freedom to attack high performance with no restraints. He would also be working with Kobe Bryant on creating a series of signature sneakers that could speak to his sleek style of play and his unyielding demand for excellence. "From there, Mark, myself and Tinker [Hatfield] went down to L.A. and met with Kobe for the first time," Avar reflects. "We sat across the table, and I went in with an open mind, and right from the start I could just tell that he was so passionate about basketball, but [also] about product and design as well. He literally blew me away within the first two minutes of talking with him. I had worked with a lot of athletes prior to that, but it was just an eye-opening experience for me, and I was amazed at how intelligent, articulate and passionate he was about every aspect of the game, product, design, performance and aesthetics. Right from that moment I was super excited to be working with Kobe." After that initial meeting, the tone had been set, and the duo was ready to tackle the performance basketball industry head-on. While the Zoom Huarache 2K4 might be the first Nike shoe you recall Kobe Bryant regularly wearing, the Flight Huarache was actually what he rocked during the beginning of the 2003-2004 NBA season in player exclusive Lakers colors. Just before he debuted the 2K4, Bryant paid homage to the ancestry of the line, which began a decade prior with enhanced fit and targeted support in mind. The shoe featured quite a few overlays, but it was also very minimal along the collar, allowing for a conforming fit unique to each wearer. Though it was technically the first shoe from Nike that he'd wear while under contract in the NBA, he was actually no stranger to the original. "It was a fun shoe, and I was very familiar with it back in High School because of the Fab Five obviously," he says. "Those shoes were so tough to find, and I think I only had one pair and I only wore them once a month. [laughs]"
So the Huarache concept came out of a singular experience I had. This doesn't always happen this way. But I was water-skiing one day, and I was sitting in the water slalom skiing. Both feet were actually in these neoprene booties, and you're strapped in. So I'm getting ready to get pulled out of the water, and I got yanked up and either the boat wasn't going fast enough or I wasn't doing something right, but I crashed. So I'm sitting there, waiting to get pulled up again, and I'm looking down, and I'm just kind of waiting, and I'm looking at how these neoprene booties sort of fit nicely around [my feet]. They just sort of conform around anybody's ankle. The neoprene bootie in a water ski fits a bunch of different people, so I'm thinking, "That's kind of cool," and then ... whup! [laughs] In the middle of that thought, all of a sudden I'm skiing again. [laughs]. So afterwards, I skied on, and then I got out of the water, and I was just looking at the booties, and I'm just going, "That's one of the problems we have with shoes, they don't really conform to different shapes of feet very well," and I said, "Neoprene does that." I went back to my studio a couple days later and started sketching up neoprene-based shoes. A lot of people think that Huarache comes from the Sock Racer, but it doesn't come from the Sock Racer at all. The Sock Racer was stretchy [in the forefoot], and I'm going, "That's not really where you want stretch." You want stretch to be [along the collar] where your feet are all different shapes. You want it to fit better [at the collar], that's where shoes should fit better, right there. So I started sketching up booties and then realized that it needed, for support, some sort of exoskeleton, because I thought it would be cool to be seen. So the whole exoskeletal approach to the shoe design sort of came out of this sort of desire to want to develop this Dynamic Fit shoe. In some ways I guess you could say it has an internal bootie. It's not really internal; you see most of it in this or in the original running shoe. I started drawing this exoskeleton over it, and I took it into Sandy Bodecker's office, this first sketch, and it's in archives. We actually have it. The first sketch sort of showed this neoprene idea with this exoskeleton over it and Sandy, he thought it was really cool, and in a red pen he just wrote, "Sneaker of the Gods." Like it looked like something that Zeus would wear, like a sandal, kind of like a sandal. I was not thinking sandal or Huarache or anything at the time, it was Sandy who wrote "Sneaker of the Gods" and [he was] kind of thinking, "Yeah, this is what Zeus would wear or Mercury or somebody." So I came back, I'm going, "It's sort of like a sandal." And then I'm going, "I don't want to call it a foot sandal or a something." So a lot of us had been to Mexico, and I'm thinking, "Instead of calling it a sandal, I'll call it a Huarache." So that's how the whole thing got started. The idea was interesting in that it focused on the fit of the shoe around your ankle and your heel and your instep rather than sort of being stretchy and conforming up in the toes. Sock Racers always make my toes go numb, so the last thing I wanted to do was create another one of those, because the stretchiness was pulling on my toenails, and it just made my toes feel funny. This was a minimalist concept of what we called conforming, or in our case, we called it Dynamic Fit with the exoskeletal support system. We didn't need a heel counter, and then we combined it with this sort of cupping. As I was finishing up the running shoe, which, by the way, was developed by Michael Donohue, and Sandy Bodecker got involved, and Mike Quinn got involved ... some of our very best people today were some of our very best people way back, in a different role. Quickly we realized that this had more legs than just being in a running shoe. So, I thought, "Well, I'll just sort of take this same idea, and transfer it into both a cross training shoe and a basketball shoe." Kind of the big three at the time: running, cross training and basketball. I did this sketch [for cross training] that pretty much mimicked the running shoe. It was very similar, but with an extra strap for the upper to go up higher in a hi-top silhouette and then a deeper, bigger midsole cradle and then, of course, the rubber was different than we would have on our running shoe. My recollection is that I had this sketch, the original sketch of the basketball shoe, and I handed that off to Eric Avar. And he was still pretty young at the time, so it was just sort of given to him to finish it all off. So he finished his design, put in some of the other little details, and he did the outsole, too. I didn't do that particular outsole. He took it to its conclusion and that was because I was busy working on the cross trainer. He was doing this one, and the running shoe was kind of just up and rolling. So that's really how it got sort of birthed. The running shoe, by the way, it didn't book at all, the original Huarache shoe, it did not book. It was going to die. Only 50 pairs were booked by maybe only one store. I remember Tom Parks saying, "You know, it's just a niche product, [we] probably shouldn't even make it." Tom Archie believed in that running shoe so much that he ordered 5,000 pairs, and he didn't even have the authority to. He was the PLM for running, and he ordered 5,000 pairs without bookings, which Nike, at least then, never would have done. He just did it anyway, which is awesome. That was so cool. Then, he was kind of in a sense on the hook for these 5,000 pairs. [laughs] He took them to the New York Marathon, put them in our booth at the New York Marathon, and started selling them. He sold them all, and people were putting them on, and it was one of those rare products that looked different, but when you put it on it also felt different and felt different for the better because it sort of fit in a new and more conforming way, and going back to the water ski analogy, it sort of just conformed to your particular shape, and it was interesting. Now there're 5,000 pairs out there, and the orders just start rolling in. And then the rest is history for that running shoe that, I think, at the end of that first year had sold 250,000 pairs.